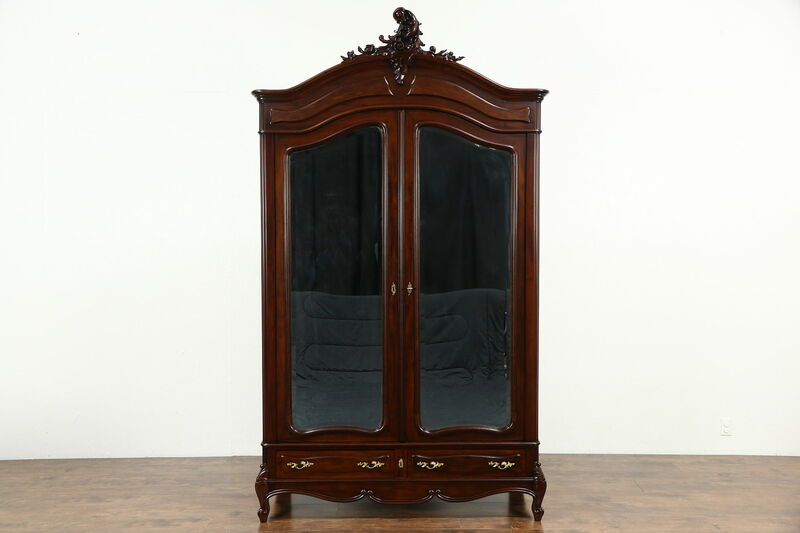 Hand carved of mahogany in France about 1910, a luxurious armoire or wardrobe has original shaped and beveled mirror doors. The glossy old finish is very well preserved with minor wear and touchups. A key operates the door lock only, the empty interior is 20" deep, so shelves or a closet pole could be installed as desired. Two lower drawers have solid oak sides with hand cut dovetail joints and original pulls. This antique furniture can be disassembled for easier moving. Measurements are 59" wide at the crown, 24" deep and 8' 6" tall.